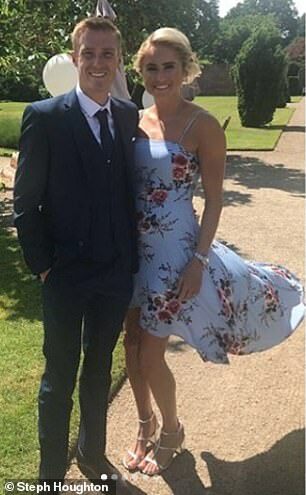 A former Premier League footballer has hung up his boots 'with great sadness' after revealing his devastating diagnosis of motor neurone disease aged just 29. 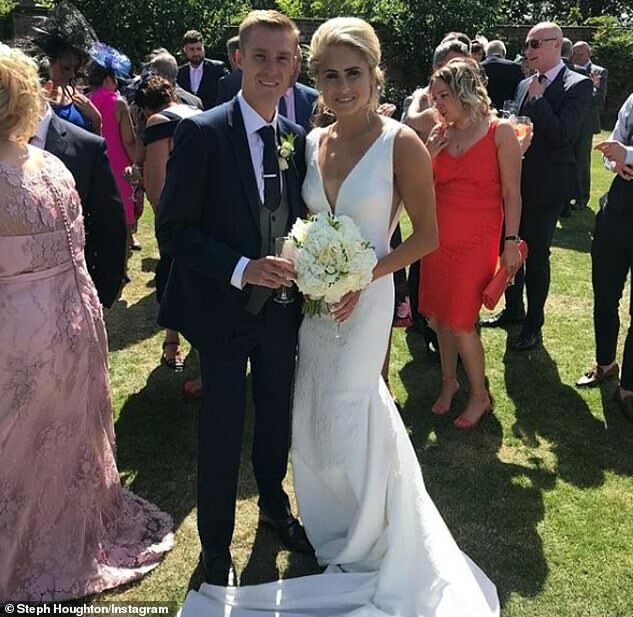 Stephen Darby, a right-back who married England women's captain Steph Houghton just three months ago in June, admitted he had faced an 'extremely difficult period'. Darby's former teammates said they were 'heartbroken' by the devastating news, with the average MND sufferer living for just two years after their diagnosis. He said in a statement: 'I would like to take the opportunity to thank my teammates, Phil Parkinson and all the staff at Bolton Wanderers Football Club for their amazing support at what has been an extremely difficult period for myself and my family. Darby, who began his career at his hometown club Liverpool and later made more than 200 appearances for Bradford City, received the diagnosis from a specialist. The player, who made one Premier League appearance and three in the Champions League, joined Bolton in summer 2017 but has not played since December. Motor neurone disease (MND) is a condition that affects the brain and nerves, causing weakness that gets worse over time. It is fatal and can significantly lower life expectancy, but some people live with it for many years. There is no cure, but treatments can help reduce its impact on daily life. Last year an American study made a link between MND and heading a football. Scientists made the discovery after examining the brain of Chicago Fire's Patrick Grange, who aged 29 in 2012 and suffered from the condition before his death. After his family donated his brain to Boston University, scientists found he had chronic traumatic encephalopathy (CTE) – a condition thought to trigger MND. Speaking last year, Dr Ann McKee, chief of neuropathology at the university, said: 'The evidence is mounting for this connection with contact sport and CTE. Darby's former team Liverpool were among many teams, players and fans to send their best wishes to him. It's always fatal and can significantly shorten life expectancy, but some people live with it for many years. There's no cure, but there are treatments to help reduce the impact it has on your daily life. 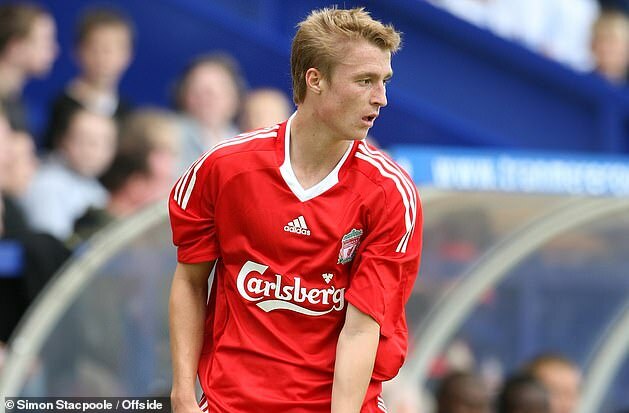 Liverpool said via Twitter: 'Liverpool Football Club are saddened by the news of Stephen Darby's retirement after he was diagnosed with motor neurone disease. Aaron Mclean added: 'Sad news that my ex-teammate Stephen Darby has had to retire due to being diagnosed with motor neurone disease. And Stephen Warnock posted on Instagram: 'Heartbreaking news about my former teammate Stephen Darby who has been diagnosed with Motor Neurone Disease. 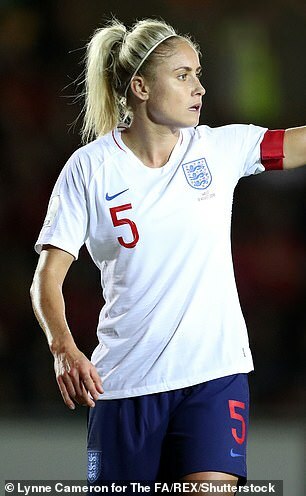 Houghton, who captained Manchester City to victory over Bristol City on Sunday, has yet to make a public statement but her club led the tributes to the defender. 'Everyone at Manchester City is behind Steph and Stephen at this time' they wrote on Twitter followed by a sky-blue love heart. Darby joined Bolton in 2017 after leaving Bradford, where he made 236 appearances and was part of the team that reached the 2013 League Cup final. 'We will be offering full support to former Bradford City star Stephen Darby, who today announced his retirement from professional football after being diagnosed with motor neurone disease,' the Yorkshire club wrote on Twitter today. It was at Liverpool, his boyhood club, where Darby learned his trade. The right-back came through the Reds' famed academy and made his competitive debut in the Champions League against PSV Eindhoven in December 2008. He made his first competitive start a year later, against Fiorentina in the same competition. While at Liverpool, Darby enjoyed loan spells with Swindon, Notts County and Rochdale before leaving for Bradford, where he later became captain. Bolton boss Phil Parkinson said: 'This is heartbreaking news for Stephen and his family and the thoughts of everybody at Bolton Wanderers Football Club are very much with him and Steph. 'He is an outstanding professional and a fantastic person. He was simply magnificent during his time at Bradford and was a key figure in the resurgence of Bradford City as a football club. He added: 'He constantly set high standards in training every day and encouraged and drove his fellow teammates on. Bolton chairman Ken Anderson added: 'We were all saddened when we found out that Stephen has to retire from the profession he loves. 'Stephen is very well thought of by everybody at Bolton Wanderers and he will always be welcome at the University of Bolton Stadium. A number of Darby's other former clubs also paid tribute to the defender today. 'Everyone at #STFC is devastated to hear of Stephen Darby's diagnosis with Motor Neurone Disease. Along with the rest of the #Football Family, we send our best wishes to Stephen and his family,' read Swindon's official Twitter account. 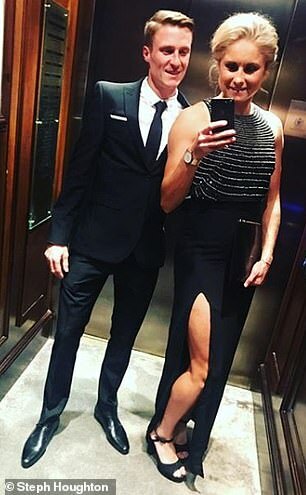 The Professional Footballers' Association has vowed to support Darby, husband of Manchester City defender and England captain Steph Houghton. The PFA's Matthew Buck said: 'As a footballer Stephen has been the epitome of a true professional. Since I first met him and began representing him at the age of 17 he has dedicated himself to the sport and has had a successful career, whilst experiencing the highs and lows of the game. 'He has become a good friend over the years and knowing Stephen throughout his football career I am sure he will face the future with the same determination and resolve he showed throughout his football career. 'I have seen first hand how difficult the last few weeks have been for Stephen, Steph and his family but he has conducted himself with a tremendous amount of dignity and bravery. 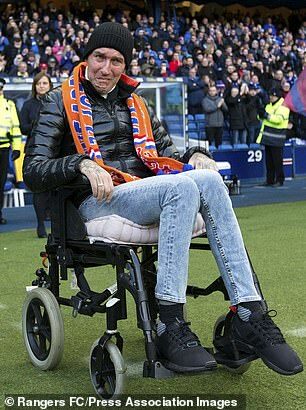 Former Rangers and Holland defender Fernando Ricksen was diagnosed with MND in October 2013, and a special tribute match was held for him at the club's Ibrox ground two years later. Writing in the programme for that game in January 2015, he said: 'Even the fact that MND patients don't have more than three years to live doesn't get me down. 'Scared? No, because what's going to happen is inevitable. OK, maybe I have only a couple of years left. That doesn't scare me, it's just that I would love to live a lot longer. I want to see my daughter growing up. That's what I'll fight for. 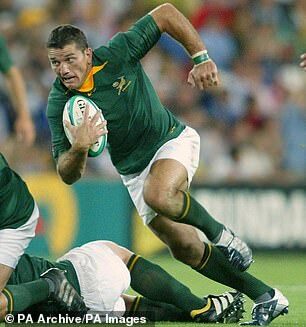 Former South Africa rugby player Joost van der Westhuizen died aged 45 in February 2017, six years after being diagnosed with MND. The World Cup winner was hailed for adopting the same 'warrior' spirit in his battle with the condition that lit up his glittering Springboks career. Former Springboks colleagues lined up to laud the 89-cap scrum-half for the grit shown facing his illness. 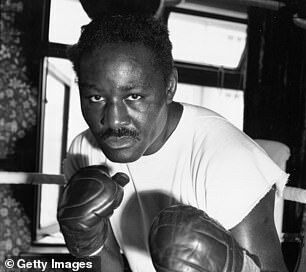 Former world heavyweight boxing champion Ezzard Charles died aged 54 in 1975. It was nine years after he was diagnosed with amyotrophic lateral sclerosis - the name for MND in America. The condition left the boxer, who won 42 amateur fights in a row while growing up, confined to a wheelchair. He became heavyweight champion in 1949 after beating Jersey Joe Walcott, and successfull defended his title against Joe Louis in 1950. Rugby legend George 'Doddie' Weir announced he had been diagnosed with MND in 2017. He began his professional rugby career at Melrose RFC, before going on to play for Scotland and the Newcastle Falcons. Later this year, the former Scotland player will receive a prestigious award from his home city in recognition of his outstanding contribution to sport, charity and Edinburgh. Weir will become the 12th person to receive the award, following in the footsteps of the likes of cyclist Sir Chris Hoy and writers JK Rowling and Ian Rankin.